Now, imagine that Sarah and Daniel are all grown up and in the early stages of their professional career. Daniel (now 26) encounters an unforeseen problem regarding his important presentation on emerging competitive market research to senior management. He’s frustrated and struggling to figure out how he’s going to get through the situation. The word, “creativity”, in our society has mistakenly been limited to only artistic endeavors, but it also encompasses essential parts of everyday life – divergent thinking, problem solving, and innovation. Whether it's a professional navigating office politics or a child figuring out how to reach a cookie on the kitchen counter, creativity is essential and utilized every single day. "We all have creative potential," says Mark Runco, Ph.D., director of the University of Georgia's Torrance Center for Creativity & Talent Development. "Our job as parents and teachers is to help kids fulfill it." Now whether that potential is being fulfilled is another story entirely. 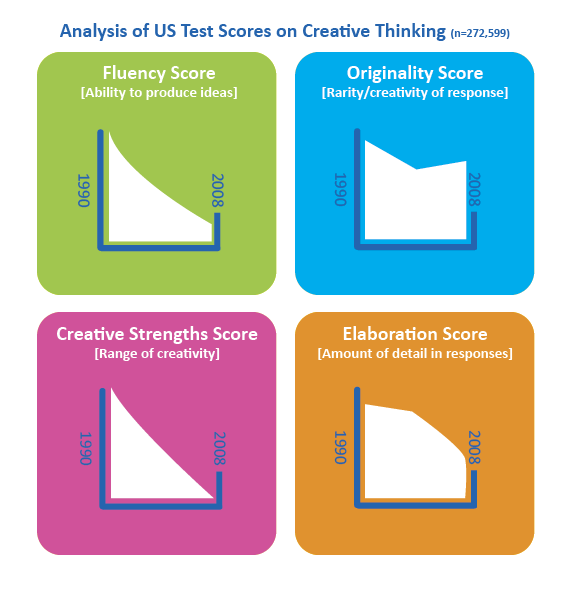 Kyung Hee Kim, Ph.D., an educational psychologist at the College of William & Mary, in Virginia, spent the past decade studying the creativity scores in more than 300,000 students in the U.S. from Kindergarten to the 12th grade. The news is not good: “Creativity scores have significantly decreased since 1990,” she says. Moreover, “creativity scores for kindergartners through third-graders decreased the most, and those from the fourth through sixth grades decreased by the next largest amount." This is especially concerning as it stunts abilities which are supposed to mature over a lifetime. Furthermore, our education system is currently not positioned to curb this trend. Due to the No Child Left Behind Act (NCLB) of 2001, many schools have eliminated courses for subject areas and activities not directly aligned to the NCLB's accountability standards for Federal funding. Significantly more time is spent preparing for standardized exams focused on specific core subjects, including Math, English and Science, and less time supporting creative, child-driven learning. As a result, in the U.S., music and the arts, widely understood as building blocks for enhancing creativity, among other skills, are considered peripheral activities more appropriate for a few talented students rather than the masses. This is in stark contrast with countries, like Hungary, Japan, and the Netherlands, that consistently rank among the highest in math and science test scores. These countries have long adopted mandates for arts and music education programs. 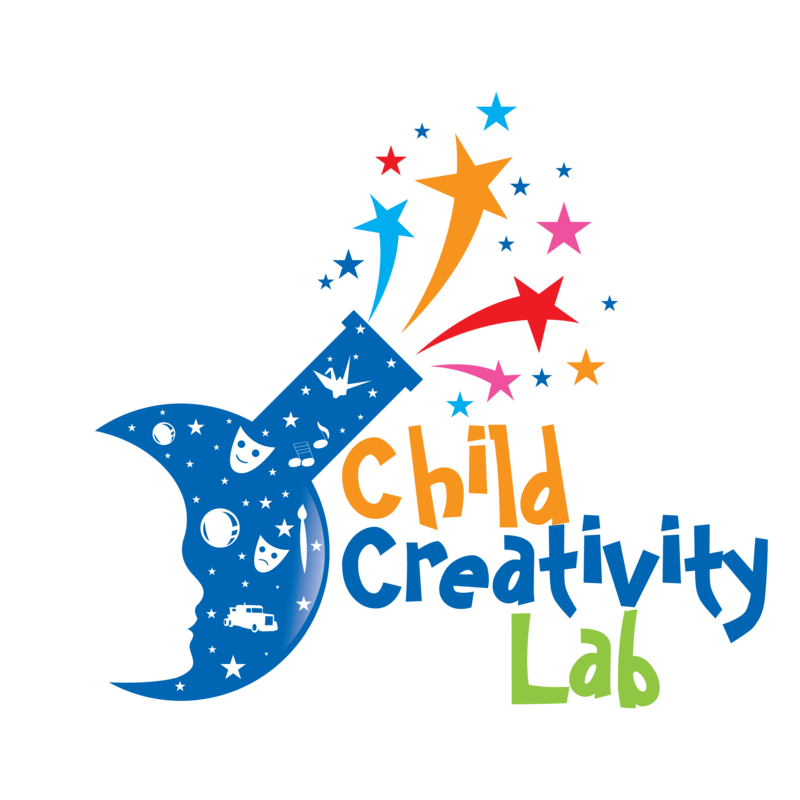 Related to Daniel’s work situation mentioned above, studies have also found that the benefits of creativity have lasting effects that are important when children age and enter their professional career tracks. IBM’s 2010 Global CEO Study, consisting of in-person interviews with over 1,500 CEOs from 60 countries and 33 industries, uncovered that in this current world plagued with increasing complexities, CEOs believe that creativity trumps all other leadership qualities, including rigor, management discipline, integrity or even vision. Employees feel similarly, as creativity is regarded as one of the top 3 personality traits most important to career success. On the contrary, 78% of those surveyed in an Adobe Systems study of college-educated employees wish they had more creative ability. Ponter, J. “Academic Achievement and the Need for a Comprehensive, Developmental Music Curriculum.” NASSP Bulletin. Vol. 83 No. 604, February 1999.